Life as a Cocktail Wonk isn’t all fabulous bars, spirit reviews, and distillery visits. It’s also countless hours on the internet chasing down esoteric details of brand lineage. Even wonkier are the multi-hour phone conversations I have with the likes of Bryan Davis of Lost Spirits Distillery, who fills my head with huge quantities of organic chemistry and distillation science while I struggle to process it into digestible nuggets in real time. Leading up to his announcement that Lost Spirits will lease their new reactor-aging technology to other distilleries, Bryan has started providing evidence that his week-long wood-aging process can replicate the chemical makeup and flavor profile of a 20-year aged spirit. In my earliest conversation with Bryan, I asked if he was using technologies like gas chromatography to understand what’s in distilled spirits. His answer then was that many organic compounds of interest are difficult to tease apart with the analytical tools available to him. In the intervening year, with better analysis tools and assistance from experts, he has been able to identify critical flavor creation processes that previously eluded analysis. In some cases he’s found evidence that contradicts the conventional wisdom about where flavor compounds are introduced. Bryan has generously worked with me for many hours to share his new insights and help me break them down into the simplified explanations– part primer on the science of spirit flavors, and part explanation of the how Lost Spirits is able to prove that their accelerated aging process works. Charts and chemistry will be bandied about, but I promise to be as gentle as I can without losing the critical elements. If your curiosity about spirits ends with poetic stories about oak barrels filled with new-make spirits before weathering dozens of Scottish summers and winters, you may want to stop here. While barrel aging is a critical part of creating the flavor of aged spirits, we now have other options, although they still treat wood aging for what it is: A controllable set of organic chemistry transformations that create the flavors encountered in Scotch Whisky, bourbon, tequila, cognac, rum, and so on. The creation of an aged, distilled spirit is a complex, multi-part process. The overarching goal is to create a tasty blend of water, ethanol, and organic compounds known as congeners. Subcategories of congeners include methanol, acetone (nail polish remover), esters, and aldehydes. With chemical names like ethyl butyrate, these congeners are what our nose and tongue sense as flavors – pineapple, cinnamon, wood, smoke, grass, and so on. By the time the spirit emerges from a barrel, it (hopefully) has a lot of the good-tasting congeners and relatively few of the bad tasting ones. For this explanation, I will focus on esters and aldehydes, the two primary categories of congeners responsible for the flavors associated with distilled spirits. A distilled spirit typically contains 300 to 500 esters and aldehydes in its makeup, each contributing some part of the final flavor profile that we perceive. With that many compounds, and in different intensities, it’s not a stretch to imagine that each distilled spirit has its own characteristic fingerprint, such that bourbon from Maker’s Mark can be distinguished from bourbon produced by Buffalo Trace. Until now, however, rigorous organic scientific analysis of spirits hasn’t been generally available for the public to quantitatively examine a spirit’s makeup and compare it to other similar offerings. Instead, people often rely on subjective tasting notes, which are notoriously fickle and differ from taster to taster. Base material selection: The organic material that provides the sugar for fermentation, which in turn creates alcohol and congeners. For single malt scotch, this is barley. For bourbon, it’s typically a blend of grains, including corn. For rum, it’s molasses or sugar cane juice. For tequila it’s agave. For cognac, this is grapes, and so forth. Yeast selection: Yeast is what converts sugars in the base material into ethanol (the consumable kind of alcohol) and assorted esters (and precursor acids). The strain of yeast used influences the type and amount of esters and acids created during fermentation. Dunder: Dunder is a big slug of bacteria that’s added to the base material and yeast during fermentation to create even more esters and acids. Dunder may be a simple as old banana peels and as exotic as dead bats and goat heads (seriously!). Not all spirits use dunder, however. Sour mashing and wooden wash backs follow a similar logic. Distillation: In this post, I discussed how distillation (aka rectification) uses heat to separate and concentrate the components of the liquid mash – yummy fruit flavored esters, good; higher alcohols (aka fusel oils), bad. In a nutshell, distillation works because all the components in a liquid boil at different temperatures: Methanol boils at 148° F, ethanol boils a 173° F, and water boils at 212° F. Each has its own boiling point, and components that boil at lower temperatures vaporize and leave the still first, while those with a higher boiling point come off last. With pot stills (distillation in batches), the longer the neck of the still, the more separation that occurs between lighter and heavier compounds. When distillers select what vapors to collect and which to discard (the “cut”), they inherently include some congeners and exclude others. With column stills (in general), the more plates it has, the more separation occurs between various components. Barrel aging: The purpose of barrel aging isn’t just about adding woody flavors to a spirit; its other critical purpose is to transform acids into simple esters, and simple esters (typically with fruity notes) into more complicated esters with notes like honey and spice. Generally speaking, the longer in a barrel, the more ester transformations can occur. It’s for this reason that a barrel-aged spirit tastes so different than its younger sibling. To make things even more complicated, the oak adds new acids to the mix, which in turn change into esters. In scientific terms, esters are the result of a chemical bonding of an alcohol or phenol to an acid. Numerous alcohol variants (ethanol, methanol, isoproply, amyl, etc…) can help form an ester, alongside several phenolic variants, while the acid component (for our purposes) must be a carboxylic or phenolic acid. With all these permutations of acids and alcohols, thousands of possible esters can be created, each with its own particular smell and flavor. Also, it’s very common that what we think of as the smell of something–say, pineapple–may actually be a combination of numerous different esters. Bryan’s research show that only a relatively small portion of what comes off the still ends up in the finished spirit. The majority of the post-distillation congeners are what’s known as precursor molecules – acids and alcohols that combine into esters during wood aging. These precursor molecules can have nasty flavors (e.g. human vomit, or butyric acid) before they get combined into esters. Thus, the importance of barrel aging to turn these acids and alcohols into yummy esters can’t be understated. As a lover of Jamaican rum, I have to point out that a notable exception to the above is high ester “funky” Jamaican rums, which get a big shot of esters due to addition of the extremely nasty dunder added during fermentation. Take a whiff of Wray & Nephew Overproof, which is bottled straight off the still, and you’ll notice a huge amount of fruity aromas–here, the result of using dunder in the mash to supercharge the ester production. Different esters have different aroma-detection thresholds–that is, the parts per million necessary for the human nose to sense them. Even though there may be lots of a particular ester in a spirit, it may not contribute much to the overall taste. A good example of this is ethyl acetate, with the aroma of green apple, pear, and nail polish remover. It’s commonly found in distilled spirits and can originate both from fermentation as well as created during barrel aging. In fact, the longer a spirit is aged, the more ethyl acetate it will likely have. Despite the frequent abundance of ethyl acetate, its high aroma-detection threshold means it typically doesn’t dominate a flavor profile. Aldehydes are organic compounds that contribute flavors to spirits, but unlike esters aren’t easily described with a simple sound bite. Like esters, some aldehydes are formed prior to distillation while others form during aging. For most distilled spirits, the primary “good” aldehydes that get targeted are acetaldehyde, vanillin, sinapaldehyde, and syringaldehyde, all of which are extracted from the oak. With one notable exception, phenolic aldehydes are formed entirely during barrel aging, rather than fermentation. The notable exception is the smoky Islay whiskies, which effectively preload the barley grains with huge amounts of peat smoke. Only a small portion of these phenols make it through to the finished product, but it’s still enough to make a powerful flavor statement – Mrs. Wonk describes it as sipping an ashtray. With this very brief overview of what comprises the flavors in a spirit, let’s look at how spirits can be analyzed in a scientific and deterministic way to truly understand what flavors are present. All esters and aldehydes have characteristics that can be used by scientific instruments to isolate and report on exactly what’s present. Before getting into the details of how the flavor compounds in a spirit are analyzed, it’s necessary to understand the concept of volatility. All esters and aldehydes have different levels of volatility, which is related to the temperature at which they boil. If you set out a bowl of mixed esters, the more volatile esters would evaporate more quickly, while the less volatile esters would evaporate more slowly. Esters with a boiling point lower than water (212° F) are termed “volatile” organic compounds (VoC). Esters with a boiling point above water’s are called semi-volatile organic compounds (SVoC). (Disclaimer: The above distinction between volatile and semi-volatile compounds isn’t completely correct, but it’s close enough for this discussion.) Different techniques are needed to effectively analyze volatile and semi-volatile compounds, an important distinction in what follows. The gold standard of material analysis is gas chromatography/mass spectrometry, aka GC/MS. You feed a sample of the material to be examined into the machine, and what you get out is a graph showing the relative amount of individual compounds present. The GC and MS are actually two different tools to isolate what’s in a given sample, but they can be used together to create a more detailed analysis than either could achieve by themselves. What follows is somewhat backwards from the traditional way of explaining GC/MS, but I find it more intuitive. Then again, I studied physics way back when, so your mileage may vary. I’m starting with analysis of “volatile range” compounds because it’s conceptually simpler to understand, and because there was already established, scientific body of research into this space long before Bryan started his analysis. The volatile range esters are generally the fruity part and may come from either fermentation or from barrel aging. Volatile analysis is easier to perform, while semi-volatile analysis (covered later) is trickier. Below is a mass spectrometry chart for the volatile compounds in a rum. The position on the X-axis indicates which compound (i.e. ester) it is, and the Y-axis indicates the relative amount of that compound. A few specific esters have been highlighted and annotated. The important takeaway here is that each spirit has its own unique “fingerprint.” It tastes the way it does because of the compounds it contains, and these charts illustrate those compounds. Spirits with the same fingerprint will taste the same because, well…they are the same. Here’s an annotated from Bryan’s first white paper on the Lost Spirit site showing the volatile range analysis for a 15 year column still rum with key esters highlighted. With the volatile flavor analysis covered, let’s turn to semi-volatile flavors. While a mass spectrometer by itself can effectively isolate the volatile range compounds, it doesn’t do well with the semi-volatile range. The presence of less-volatile compounds in the sample muddies the results. 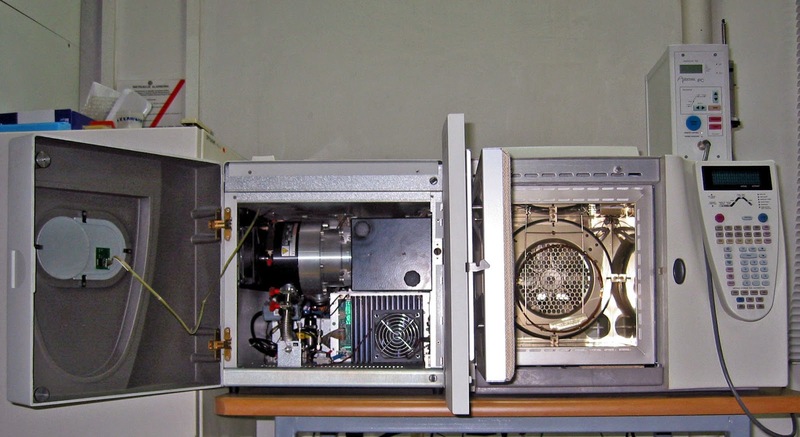 To address the problem, the sample (rum, in this case) needs to be pre-separated, so that only separated, bite-sized chunks of the semi-volatile range of compounds are fed into the mass spectrometer. This is typically done with a gas chromatograph. The very simple explanation of a gas chromatograph is that it’s a very long, very narrow tube in a temperature controlled oven. The sample source is fed into the tube, along with a steady flow of an inert gas. The more-volatile (“lighter”) compounds will travel through the tube faster than the less-volatile compounds, meaning that the compounds are (mostly) well separated as they emerge from the end of the tube over time. In GC/MS, which Bryan uses for semi-volatile analysis, the output from the tube (i.e. the GC) is fed directly into the mass spectrometer. When the purified, semi-volatile-only portion finally arrives at the mass spectrometer, the MS then further isolates the various semi-volatile materials, such as sinapaldehyde and vanillin. In the second paper Bryan published on the Lost Spirits site, he shows his analysis of semi-volatile components in a demerara rum distilled at the Port Mourant distillery in Guyana in 1975, then barrel aged for 33 years. Below are the two annotated charts from that paper. When compared side-by-side with unaged pot still rum from the Lost Spirits distillery, it’s obvious that the aged rum has a far greater intensity of semi-volatile components, offering strong evidence that these flavors only come from wood aging. During one of my early meetings with Bryan, while drinking Scotch and overlooking the pacific, I had an “A-ha!” moment when he offhandedly mentioned that your tongue functions as a crude gas chromatograph. The more volatile elements vaporize first, so those flavors will be the first things you notice, while the least volatile elements vaporize last and are the last thing you sense. With that knowledge, you should (in theory) be able to look at a mass spectrometry analysis and predict the order in which you’d experience the spirit’s flavors. In some aspects, this is the holy grail of spirits reviews as it eliminates a taster’s subjective blind spots and biases. This isn’t to say that highly trained tasters don’t add value to the process. Rather, if organic analysis of spirits was readily available, it would be another tool that levels the playing field and would help provide more consistent reviews. It’s important to note that the correlation between volatility and the order you perceive them only works for tasting. When you smell (nose) a spirit prior to tasting it, all the components are all jumbled up together. Why does spirit analysis matter? I’ve barely scratched the surface of the science that I encountered when writing this post, and have deliberately over-generalized certain concepts so as to not turn this into a college organic chemistry course. As a person with a strong science and technical background who also thoroughly enjoys spirits, I’m immensely excited about the work of folks like Bryan Davis and Richard Seale of Foursquare Distillery in Barbados, both of whom promote rigorous understanding and sharing their knowledge of the spirit process, rather than relying on nebulous storytelling and marketing speak. On a larger scale, the ability to quantify components of spirits is useful for other purposes. It can provide an invaluable tool to distillers to more confidently tailor the recipes and techniques they use to craft a target flavor profile. While the art and craft of spirits production remain, it signals a move from alchemy to science. Keep in mind that this sort of analysis isn’t limited to finished spirits. It’s easy to imagine a side-by-side analysis of the same new-make spirit aged in American oak vs. French Oak vs. the Brazilian hardwoods used to age cachaça. After equal amounts of aging, analyze all three to see how different woods affect aging. Another interesting idea is to start with a newly made spirit in a single barrel, and at periodic intervals extract samples and run the volatile and semi-volatile analysis to create a model of what compounds form and at what rate for that type of wood and char level. Counterfeit detection is another interesting use case: Starting with a known good spirit sample, a comparison of the fingerprints of two spirits will indicate whether they’re wildly different or at least plausibly the same. You can bet money that the big distilleries do this. I’ve seen the analysis units at Maker’s Mark. Even an estimate of actual time spent in a barrel could be obtained, given enough data about the initial conditions. A big stumbling block for this sort of analysis is that it’s expensive and time consuming to set up and run. My hope is that over time, the tools needed for this sort of analysis will become more commoditized, and the knowledge necessary to understand the results will be more widespread. This could yield a comprehensive library of standardized, repeatable studies across a broad matrix of variables, and ultimately, a more useful understanding of the spirit creation process to be available to everyone. What specific gc ms u it was used for the analysis? I work in the industry and HP agilent series have been top notch. HP Agilent 6890/5973 GC/MS I believe is the model. Even the GCO once calibrated is an interesting tool. Hi Larrian – Offhand, I don't know the model, but I do know that Bryan works with a couple of PhDs at UC Davis. I do recall him saying that it took a while to find an effective column to allow effective semi-volatile analysis. I'll ask him and if I find out, will update here. Bryan says it's a Shimadzu GCMS QP 2010. Superbly interesting! What do the US regulations about whisky making say about hyper-accelerated aging? Can you influence the spirit between distilling and aging in barrel via chemistry and, say, microwaves and still call it whisky? Thank! Regarding labeling of accelerated aged products, as far as I know, it shouldn’t be a problem calling it “whiskey”. But you couldn’t call it “bourbon” or “straight rye”, etc.